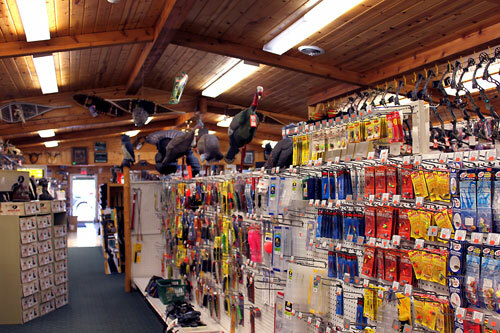 Log Cabin Store has all the gear for the avid fisherman. No matter what season it is we carry everything you need to reel in the big one including a helpful, knowledge staff that can direct you to the local hot spots. When you take a stroll through our store, you can’t help but notice fish mounts caught on our local waters. We stock all the well known brands in fishing including Abu Garcia, Berkley, Eagle, Humming Bird, Marcum, Mister Twister, Northland, Plueger, Rapala, Shakespeare, Shimano, St. Croix, Stren, Ugly Stick, Vexilar and Zebco. During ice fishing season we carry a variety of ice items including augers and blades, chisels, ice jigs, live bait, ice houses and terminal tackle. Muck Boot brand defines a standard of comfort and quality that goes beyond the expectations of customers for a 100% waterproof top to bottom boot. Slip into a pair of these hands free easy on/easy off boots, and you will be sold on them. They are perfect for fishing, hunting, all-terrain, lawn and garden, chores and farm work. We also stock Georgia and Rocky Boots. St. Croix rods have been hand crafted in Park Falls, Wisconsin for over 60 years. In Park Falls, over thirty pairs of hands contribute to three-dozen different steps before a St. Croix rod is deemed ready to charge into the world looking for action and ready to take on any fish in the world. We are proud to be a dealer of these amazing hand crafted Wisconsin rods. Put one in your hands and you will not be disappointed. So much goes into a St. Croix rod so you can pull so much out with one!